With those defiant words, William Logan Crittenden, an American officer and veteran of the Mexican War, went bravely to his death on a hot August night in Havana in 1851. Bored with the tedium of service in the peacetime Army, two years previously Crittenden had resigned his commission in the belief that more exciting and lucrative work was to be found as a mercenary. He ended up taking part in an ill-fated expedition seeking to liberate Cuba from the Spanish, and on August 15, 1851, Crittenden and a small group of men under his command were taken prisoner. Sentenced almost immediately to death by firing squad, on the day of their execution Crittenden and his comrades were ordered to kneel and turn their backs to their captors. Legend has it that when presented with this demand Crittenden flatly refused, having written to his uncle, “I will die like a man.” He was just 28 years of age at the time. During his short but eventful life, Crittenden had at least one other noteworthy accomplishment to his credit. 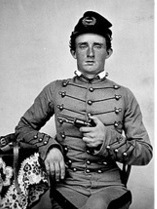 He was a product of West Point, having originally entered the Academy as a member of the Class of 1843. Turned back twice, he finally managed to graduate in 1845 – albeit as the lowest-ranked member of his class – the “Goat”, in West Point parlance. By tradition dating back to the Class of 1818, the “Goat” is the cadet with the lowest standing in the USMA graduating class. One might naturally assume that graduating with this somewhat dubious honour effectively represents an automatic sentence to a lifetime of subsequent ignominy. But as James S. Robbins shows, this need not necessarily be the case. 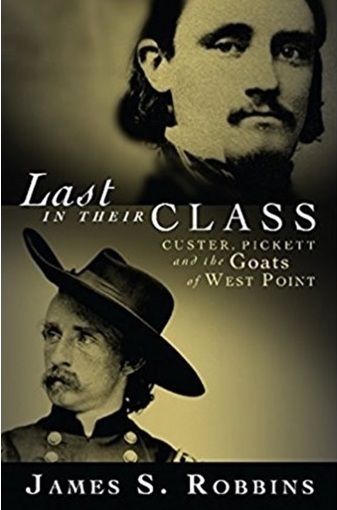 In “Last in Their Class: Custer, Pickett, and the Goats of West Point” Robbins explores the lives and careers of some of the early Goats, dating up to the time of the Civil War. And as events would subsequently demonstrate, notwithstanding their apparent lack of success at West Point, a number of the members of this group turned out to be remarkably tenacious, resourceful, and courageous soldiers, especially when thrust into the crucible of combat. Robbins offers a couple of possible explanations for this curious phenomenon. One hypothesis he advances is that, for at least some individuals, their class standing as Goat had nothing to do with a lack of intellectual horsepower or leadership ability. Rather, it was more a case of the feeling that competing for high standing in their class was a game that they simply did not care to play. Somewhat reminiscent of the RMC cadets who are “in for a good time, not a long time”, the free- spirited Goats disdained the abundance of picayune regulations imposed on them by the Academy, and preferred to concentrate their efforts on pursuits – however mischievous – that gave them a genuine sense of satisfaction and accomplishment. Another possible explanation has to do with the impact that a cadet’s class standing had to do with the service assignment he could expect after graduation. By tradition, graduates standing in the upper echelons of their classes tended to be commissioned in branches such as the engineers and artillery. Those ending up on the bottom rungs of the class were typically found themselves assigned to branches such as the infantry, mounted rifles, or cavalry, where they were far more likely to see action. Not surprisingly, almost to a man the Goats were directed towards these branches of the Army, where those who wanted to would invariably be provided with abundant opportunities to prove their mettle on the battlefield. One of the most celebrated Goats of the pre-Civil War era, and one to whose life and career much of this book is devoted, was George Armstrong Custer, who today is remembered chiefly for his leadership of the disastrous raid at Little Big Horn in 1876. Born in Ohio in 1939, Custer worked briefly as a teacher in a one-room schoolhouse before obtaining an appointment to West Point in 1857. While at the Academy, the high-spirited Custer continually ran afoul of the forces of law and order, racking up over 700 demerits for various sins, and narrowly skirting the limit that would have meant expulsion. He graduated dead last in his class of 34 on June 24, 1861. But as fate would have it, the Civil War that had begun earlier that year was rapidly heating up, and less than a month after receiving his diploma and commission Custer found himself heading into action with his regiment at the First Battle of Bull Run. As a cavalry officer, Custer found himself in an environment which was ideally suited to his personality and talents, and over the next four years he made a meteoric ascent through the ranks of the Union Army. By the time the Confederates surrendered at Appomattox in April 1865, the once-recalcitrant former cadet held the rank of Brevet Major General. Naturally charismatic and a brilliant tactician, at just 25 years of age Custer was widely admired and respected by his soldiers, and had gained a formidable reputation for the role he had played in many of the war’s most important engagements. Unfortunately, Custer’s career after the Civil War proved unable to sustain an equally stellar trajectory. Reverting to the peacetime rank of Captain, he was denied promotions that he felt he deserved, and in 1867, following his conviction for various offences by a court martial, he suffered the humiliation of being suspended without pay for a year. Later, a short-lived flirtation with a potential political career only served to land him in the bad graces of his former Civil War colleague Ulysses S. Grant, who by that time was sitting in the White House as President and Commander-in-Chief. Seeking to redeem himself, in the spring of 1876 Custer begged his superiors to allow him to participate in an expedition against the Sioux Indians in southern Montana. In May of that year, President Grant finally relented, and a month later, Lieutenant Colonel Custer was on his way, at the head of a force of just over 600 men. Little could he have imagined that he and his soldiers were headed straight into what would become one of the greatest disasters in American military history. In his book, Robbins notes that a number of factors conspired against Custer and his solider to bring about their eventual demise at the hands of the native warriors. One was the fact that, over the course of the Plains Wars, the Indians had become much more skillful warfighters, and were particularly adept at the use of hit-and-run tactics. A second consideration was the fact that the Indians at Little Big Horn were far better armed than they had ever been in the past. By one account, at least 200 of them carried Henry or Winchester repeating rifles, weapons that were vastly superior to the single-shot Springfield carbines issued to the U.S. troopers. Likely the biggest contributing factor to the debacle, however, was a series of poor judgment calls made by Custer himself. For example, at the outset of the mission he decided to heave his artillery and Gatling guns behind, presumably in the belief that this would enable his force to progress more rapidly into hostile territory. Similarly, when the Americans discovered a major Sioux village on June 24, Custer dramatically underestimated the size of the opposing forces. As Robbins notes, based on preliminary reconnaissance, Custer reckoned that the Sioux could muster perhaps 1,500 warriors. In fact, there were at least 3,000, and possibly as many as 5,000. Arguably the most critical error in judgment which Custer made was his decision to attack in broad daylight on the afternoon of June 25, rather than waiting until the earlier hours of the following morning, when he would have had the greatest chance of surprise. In any event, after briefly being caught off guard, the Sioux rallied and counterattacked ferociously, with disastrous results for Custer and his men. The initial attack quickly faltered and soon turned into an all-out rout – and very shortly thereafter, a bloodbath. Custer’s 7th Cavalry was decimated, losing nearly half of its total strength killed or wounded, and almost all of its officers, including Custer himself. When news of the defeat broke, the country was stunned, and military and political leaders roundly condemned Custer’s handling of the affair. The one-time Golden Buy of the Civil War era would now be remembered mainly for his last disastrous mission, his name forever a byword for one of the most humiliating defeats the U.S. Army had ever suffered. If there is any overarching theme that resonates throughout Robbins’ book, it may be that while West Point itself is an institution that has served America very well, an individual cadet’s class standing at the Academy is at best a very tenuous predictor of his or her future potential for command. Far from being the hapless laggards many might be quick to dismiss them as, the Goats whose stories Robbins recounts were independent-minded nonconformists who in many cases chose to seek their own path, rather than meekly follow the one that had been prescribed for them by higher authority. When circumstances called for it, many of them rose heroically to the occasion, and provided themselves to be worthy standard bearers of the highest traditions of their alma mater. Indeed, a more modern day illustration of this phenomenon might be the case of Hal Moore, who graduated from West Point in 1945. Moore wasn’t the Goat of his class, but he wasn’t far from it; upon graduation, he stood in the bottom 15% of his class. Twenty years later, by now a Lieutenant Colonel, Moore led the 7th Cavalry – the same unit George Custer has commanded at Little Big Horn nearly a century earlier – into the first major engagement of the Vietnam War at the Battle of Ia Drang. The events of that action were later recounted in a bestselling book, later made into the film We Were Soldiers. For his leadership in that operation, Moore was awarded the Distinguished Service Cross, and he continued to enjoy a highly successful military career until retiring as a Lieutenant General in 1977. Little wonder then that by tradition at West Point, on graduation day the Goat was the newly-minted officer who received the loudest cheer. Even though the Goat was officially done away with 40 years ago, according to Robbins, the “Spirit of the Goat” – reflecting the heart and soul of the American solider – continues to live on. The Goat, indeed, is the indomitable underdog, the stubbornly rugged individualist who continues to fight on relentlessly in the face of seemingly impossible odds, and the solider who has ultimately enabled America to prevail upon the battlefield, time and time again. God bless the Goats, and all they have done for their country. And Happy New Year to all.